Continuity mistake: When the Man in Black wakes up with a noose around his neck, there are only 4 distinct loops in the hangman's knot. A few seconds later, he cuts the rope and collapses to the ground, and there are now 6 distinct loops in the hangman's knot. Trivia: Dolores tells William: "They say great beasts once roamed this world, as big as mountains, but all that's left of them is bone and amber." This is a general allusion to dinosaurs, of course; but, more specifically, it's a tip-of-the-hat to "Jurassic Park," by author Michael Crichton, who also wrote the original "Westworld." The theme of most of Crichton's science fiction was human shortsightedness resulting in scientific nightmares. 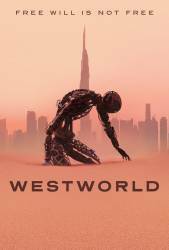 Crichton's "Westworld" and "Jurassic Park" are virtually identical stories about scientific amusement parks running amok. Man in Black: This whole world is a story. I've read every page except the last one. I need to find out how it ends. I want to know what this all means. Lawrence: See, now that's why I never learned to read. Dr. Robert Ford: You can't play God without being acquainted with the Devil. Teddy Flood: Well, your mouth moves fast enough. How about your gun?